The sun was up and the weather mild at the one-mile oval in Avondale, Arizona. 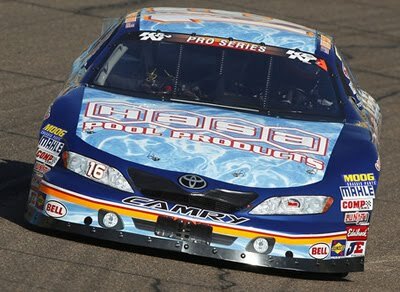 The #16 Hasa Pool Products / White Flyer / NAPA Filters Toyota Camry arrived for the NASCAR K&N Pro Series West season opener at the Phoenix International Raceway eager to start their 2011 season. The two practice sessions proved productive and driver Moses Smith finished in the top ten in the final practice. A solid qualifying run placed Moses on the outside of row eight for the 4:30 p.m. start of the 100 lap main event. By lap 24, Smith had moved up to seventh position. During the early part of the race, the glare from the sun was a real issue. Going into turn one Moses commented that he could not see. “The middle laps of the race were tough. I literally could not see the entry to turn one, it was a leap of faith lap after lap. Then by the time I could see turn 1 again, I could not see the exit of turn 4…gotta love that phoenix sun.” Moses elaborated. Two pits stops, scheduled about thirty laps apart, shuffled the #16 Hasa Pool Products / White Flyer / NAPA Filters Toyota Camry towards the rear of the pack twice. The 3 Amigos Organic Blanco 100 presented plenty of action. The race, which lasted one hour and thirty-five minutes, included eight caution flags for a total of forty-one laps. However, Moses managed to steer clear of the on track crashes to return to the front. Moses would like to thanks his 2011 sponsors Hasa Pool Products, White Flyer, NAPA Filters, and Blimpie for their support and encouragement. The #16 team, led by Crew Chief Mario Isola, is looking forward to the next NASCAR K&N Pro Series race on April 16 at the All American Speedway in Roseville, California. For more information on Moses Smith, please visit www.mosessmith.com. You can visit our sponsors’ websites at www.hasapool.com, www.whiteflyer.com, www.napafilters.com/ and www.blimpie.com/ . 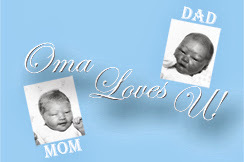 Join Moses on Facebook and/or Twitter! 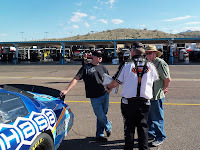 For more informations on Bill McAnally Racing and our race partners, please visit our website at http://www.billmcanallyracing.com/. Bill McAnally Racing is now on Facebook. Become a fan and stay up to date with the latest happenings with your favorite BMR race teams. Moses Smith races the Hasa Pool Products / NAPA Gold Filters / White Flyer #16 Toyota Camry in the NASCAR K&N Pro Series West Season Opener. The NASCAR K&N Pro Series West driver Moses Smith is heading to Phoenix International Raceway for the series 2011 season opener. The 3 Amigos Organic Blanco “100” will be on February 24th. Coming off his best season ever in the NASCAR K&N Pro Series West, the three-time Most Popular driver and Arizona resident, Moses Smith would like nothing better than to record a win in front of his home-town crowd. 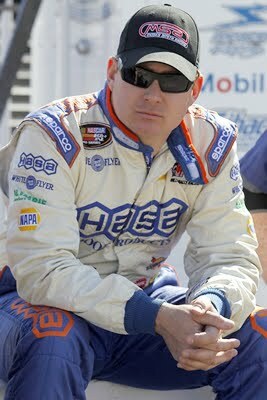 The veteran driver from Bill McAnally Racing returns to drive the No 16 Hasa Pool Products Toyota Camry. 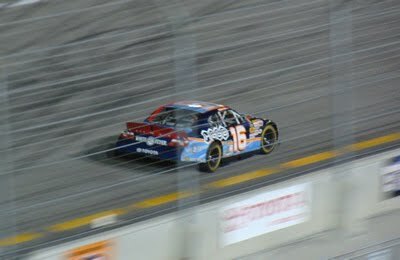 NAPA Filters will return strongly in 2011, sharing exposure on the No.16 Toyota with Hasa throughout the year. The BMR team effort will be made up of four drivers including; three-time NASCAR K&N Pro Series West Champion Eric Holmes, 2010 NASCAR Canadian Tire Series Champion DJ Kennington, three-time NASCAR K&N Pro Series West Most Popular Driver Moses Smith, and NASCAR newcomer Travis Pastrana who later this year will make his debut in the NASCAR Nationwide Series for Pastrana Waltrip Racing. The Phoenix race will be televised on SPEED Channel. Check your local listings for date and time. The event will also be covered with lap-by-lap coverage on the NASCAR Home Tracks website. For more information on Moses Smith, please visit www.mosessmith.com. You can visit our sponsors’ websites at www.hasapool.com, www.whiteflyer.com, and www.blimpie.com . Become a fan of Moses Smith on Facebook and you can now follow him on Twitter. Bill McAnally Racing is heading to the NASCAR K&N Pro Series West season opener at Phoenix International Raceway with a lineup of drivers that includes three-time series champion Eric Holmes, 2010 NASCAR Canadian Tire Series Champion DJ Kennington, three-time NASCAR K&N Pro Series West Most Popular Driver Moses Smith and action sports star and NASCAR newcomer Travis Pastrana. They will be competing in the 3 Amigos Organic Blanco “100” on Thursday, Feb. 24, at PIR. 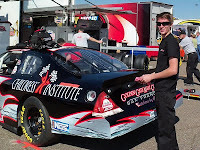 Holmes is looking to make it two-for-two at the spring race at PIR, hoping to repeat his win of a year ago in the No. 20 NAPA AUTO PARTS Toyota Camry. Kennington will be in the No. 12 Castrol Edge/Northern Provincial Pipeline Toyota Camry. The St. Thomas, Ontario, Canada resident had five wins in 2010, all coming on ovals. 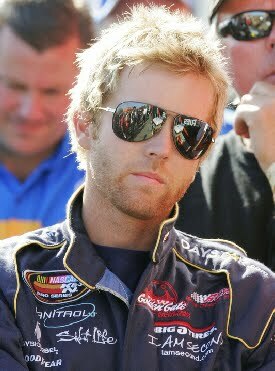 He finished on the podium in second place in the 2011 NASCAR Toyota All-Star Showdown in January. Coming off a career-best season, Smith would like nothing better than record his first series win in front of his home-town crowd. The veteran driver from Bill McAnally Racing returns to drive the No 16 Hasa Pool Products Toyota Camry. NAPA Filters will return strongly in 2011, continuing their 13 year partnership, while sharing exposure on the No.16 Toyota with Hasa throughout the year. 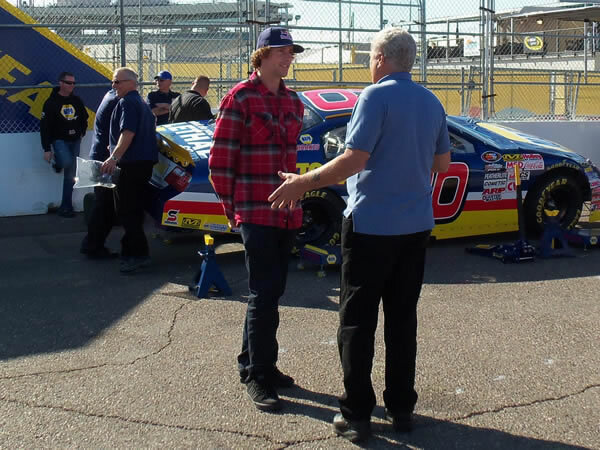 Through a partnership, BMR and Pastrana-Waltrip Racing have worked together to get Pastrana his first visit as a NASCAR driver to PIR to gain valuable seat time. He is driving the No. 99 Boost Mobile Toyota Camry. 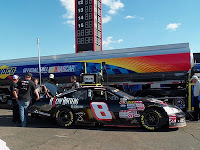 The car coming out of Pastrana Waltrip Racing’s 2010 Nationwide fleet, was prepared by BMR and will be manned by team members from Pastrana-Waltrip Racing and BMR led by crew chief Mike Greci. Pastrana, who who later this year will make his debut in the NASCAR Nationwide Series for Pastrana Waltrip Racing, recently made his NASCAR debut at the Toyota All-Star Showdown in Irwindale, Calif., where he finished sixth. Track Photo by Jae Jae W.
The season opener on 02/24/2011 is the first of 14 races in the 2011 NASCAR K&N Pro Series West season. 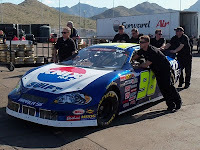 The series will return to the Arizona track on November 12 when the 2011 season championship campaign comes to a conclusion. The 2011 schedule features a return to several tracks. 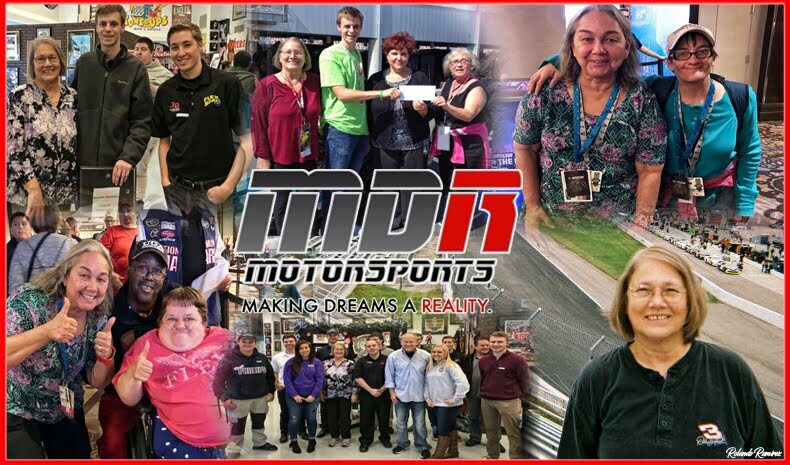 Included is a race on June 11 at The Bullring at Las Vegas Motors Speedway where the series raced in 2001, 2002 and 2003; a race on July 10 at Evergreen Speedway in Monroe, Wash. and a race on Sept. 3 at Spokane (Washington) County Raceway. A key event on the schedule is the NASCAR K&N Pro Series East-West combination race at Iowa Speedway in Newton, Iowa on May 21. The fifth edition of the East-West challenge will be the same weekend with a NASCAR Nationwide Series race at the track 30 miles east of Des Moines. 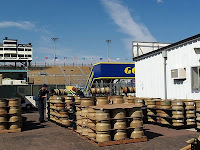 Again in 2011, the schedule includes three road course events – Miller Motorsports Park in Tooele, Utah on April 30; Infineon Raceway in Sonoma, California, on June 25; and Portland (Oregon) International Raceway on July 24. For the fourth straight year, the NASCAR K&N Pro Series West will make two visits to All American Speedway in Roseville, California. 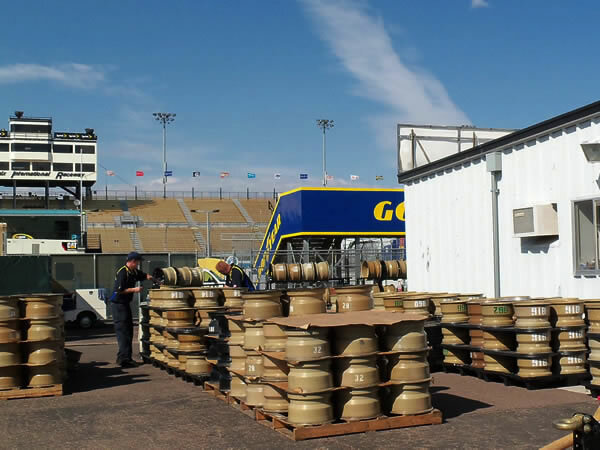 The historic fairgrounds track will host the series on April 16 and again on Oct. 15. The series will visit Toyota Speedway at Irwindale (California) on July 2, participating in the track’s big Fourth of July holiday celebration event for a fifth consecutive year. 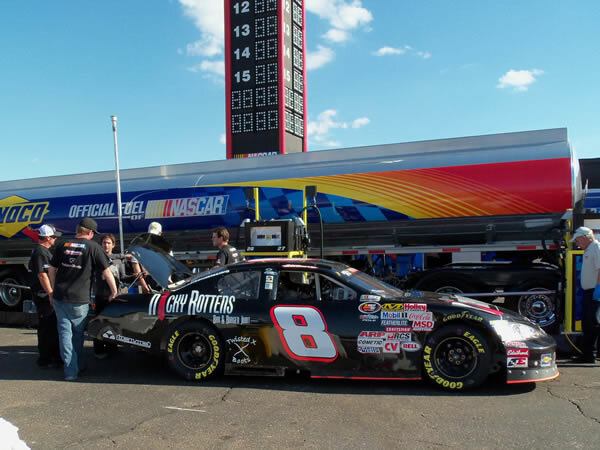 Two other popular short-track events on the 2011 schedule for the NASCAR K&N Pro Series West include a visit to Colorado National Speedway in Dacono, Colorado, on August 6 and a trip to Montana Raceway Park in Kalispell, Montana., on August 13. 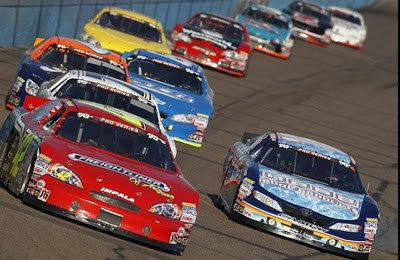 The K&N Pro Series is the highest level of NASCAR's developmental race series. Many great drivers have entered one of the three national NASCAR series from this level. Richard Childress, Joe Gibbs and Michael Waltrip are all team owners in the NKNPS. 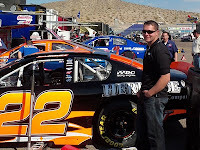 Additionally the K&N Pro Series uses race cars that are similar to those used in the NASCAR Nationwide Series. 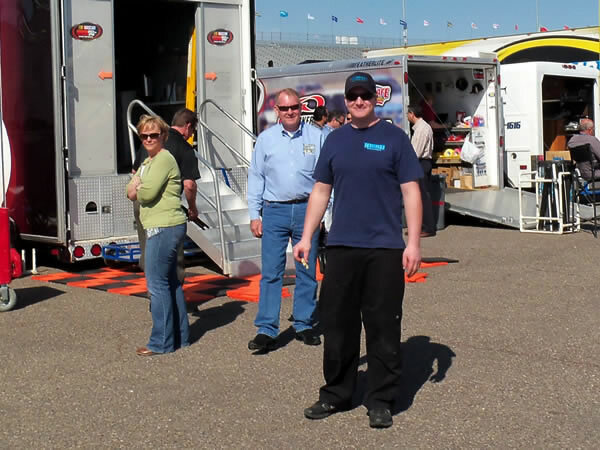 Therefore, it is only natural for a driver to move up from the K&N Pro Series to the Nationwide Series. 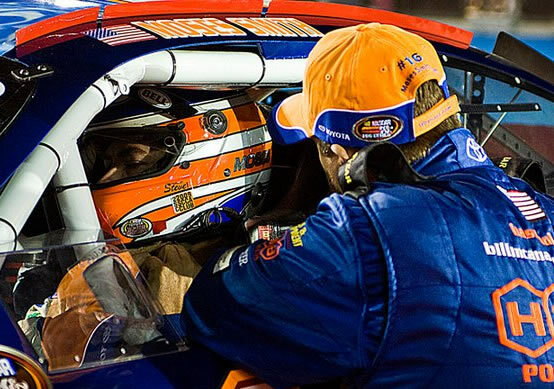 While most drivers toil to that end, few are actually able to climb up that NASCAR Ladder. Blake Koch is one of the lucky ones. I first had the opportunity to meet Blake when he raced in the NKNPS against my son. Moses and Blake were locked in tight battles race after race yet always managed to keep their encounters clean. Blake Koch, of West Palm Beach, Florida, drove the for the Golden Gate - Richard Childress Racing Development Team for nine of the twelve K&N Pro Series West races in 2010. He collected ten top-ten finishes with three top-fives. His best finish of the year was a second place at the Toyota Speedway on the fourth of July weekend. Blake’s sponsors included Daystar, Tire Kingdom, I Am Second and Salt Life. 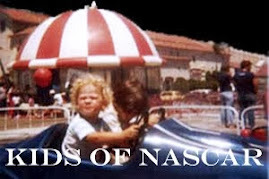 When I learned that Koch (pronounced “Cook”) would be driving the #81 for MacDonald Motorsports in the second Nationwide race at the Phoenix International Raceway, NASCAR Race Mom (NRM) had to interview him to learn what was up! 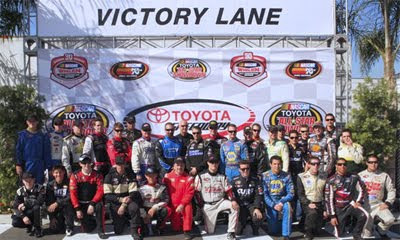 NRM: We missed seeing you at the NASCAR Toyota All-Star Showdown this year. What have you been doing in the off-season? Blake Koch: I Have been racing a little bit back in Florida, but we have mainly been trying to put deals together to run full time in the NASCAR Nationwide series. I have also been working a lot trying to make ends meet. NRM: Tell all us fans what you and MacDonald Motorsports have planned for the year 2011? Blake Koch: As of right now, the only thing guaranteed is PIR. MMS and I are working very hard and seeking every opportunity to run as many races as possible and compete for rookie of the year. NRM: What influences shaped the way you approach your sponsor relationships? Blake Koch: I think it is very important to surround yourself with good people, I put God first in my life and I try really hard to connect with sponsors that are OK with that. NRM: The race this month at PIR will be your third start in the Nationwide Series. What have you learned from your previous Nationwide races? Blake Koch: It will actually be my 4th start, I have learned that respect goes along way. You have to be really fast just to make the show, so team work and chemistry is really important. Getting on and off pit road is key too. 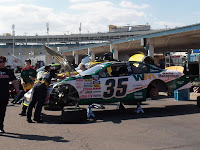 NRM: You have run at Phoenix International Raceway twice in the K&N Pro Series West. What is your favorite and least favorite aspect of this track? Blake Koch: The fans are awesome in Phoenix!! You can race two wide there and that is always a plus with a race track. My least favorite is trying to get the car right with two completely different turns. 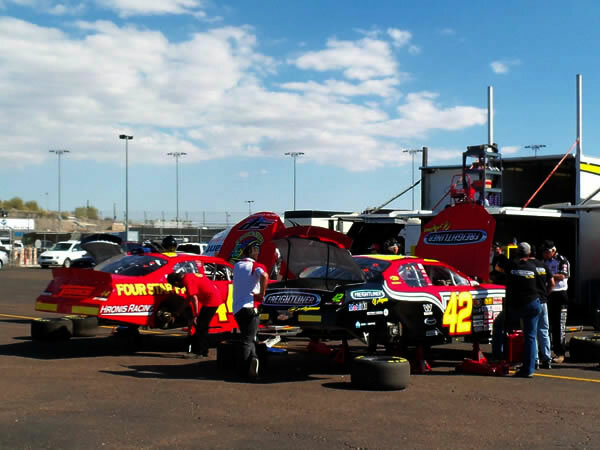 NRM: What's the biggest difference in style between racing in the K&N Pro Series West and the Nationwide series? Blake Koch: The tires are a huge difference which makes your driving style change tremendously. There is also a lot more patience and respect going on in the Nationwide series. But the K&N series prepares you and develops us for a good transition. Sunny California did not disappoint the racing crowd at the Toyota Speedway last weekend. The weather was in the warm seventies and the crowds were passionate. While the first practice on Friday proved challenging for the #16 Hasa Pool Products/White Flyer Toyota Camry, the team’s drastic adjustments sparked optimism for the second/last practice. Their hard work was rewarded with improved lap times. Despite the tight competition (only 0.133 separated 10th position from 21st); Moses qualified in twenty-first position. He started the showdown just one place behind action sports star, Travis Pastrana. Having successfully gained their spot in the Showdown, the team had a rare opportunity to relax together and watch the 50-lap “last chance” K&N Pro Series Qualifying race to finish up their night. Race day started with a packed autograph session. Over 500 fans arrived early to speak to their favorite drivers and collect race memorabilia. At 8:35 p.m., Grand Marshal and NASCAR star Michael Waltrip waved the green flag to start the forty-car 225-lap K&N Pro Series Toyota All-Star main event. 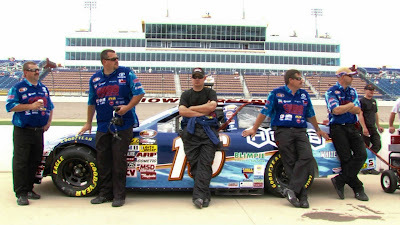 It did not take long for the #16 Hasa Pool Products Toyota Camry’s strategy to go awry. On lap twenty-seven, Moses was among those involved in a multi-car accident between turns one and two. Left with nowhere to go, he t-boned his teammate, Eric Holmes. This contact caused damaged to the front of the Camry and forced the toe out of alignment. Moses had to make two unscheduled pit stops to address the damage. Thanks to the skillful efforts of the Hasa Crew, the #16 Hasa Pool Products/White Flyer Toyota Camry rejoined the field in back of the pack, but on the lead lap. During the long green flag runs in the second one hundred laps, Moses patiently moved up through the pack. For the start of the last twenty-five lap portion of the 2011 NASCAR Toyota All-Star Showdown, Moses took the green flag from thirteenth position. He worked his way up to fifth place before oil from a competitor’s race vehicle made it difficult to maneuver the corners. During the last few laps of the race, caught up high and on the outside, Moses lost a crowd pleasing three-wide battle to finish the race in ninth place. The race lasted an hour and fifty minutes and was slowed by 11 cautions including two red flags and two competition yellows. The 2011 NASCAR K&N Pro Series season opener will be in conjunction with the top three national touring series at Phoenix International Raceway on February 24th.